This portrait of Zara Philips taken by celebrity photographer Rankin was one of six lots up for auction at Bonhams in London on 22 October on behalf of BBC Sport Relief. Its estimated value was £3,000 - £5,000, but failed to sell on the day. 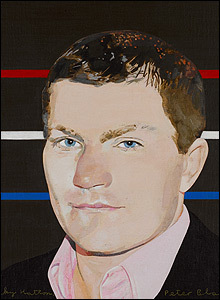 Boxer Ricky Hatton was the subject of one of the other portraits going under the hammer. 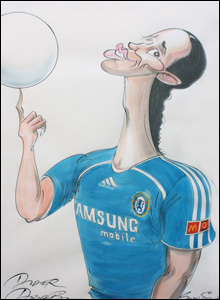 This drawing, by celebrated cartoonist Gerald Scarfe, sold for £2,400 including the buyer's premium. 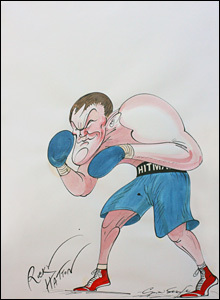 Hatton, who came third in the BBC's 2007 Sports Personality Of The Year poll, was also caricatured by Sir Peter Blake. The upper estimate for this portrait was £25,000, but also failed to sell. 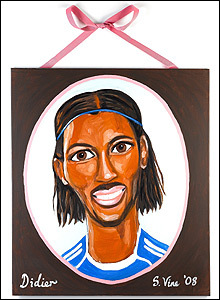 Gerald Scarfe also drew a portrait of Chelsea footballer Didier Drogba. This picture's estimate was £2,000 - £3,000 but did not find a buyer. The footballer was also the subject of Stella Vine's oil painting, estimated at £6,000 - £8,000. 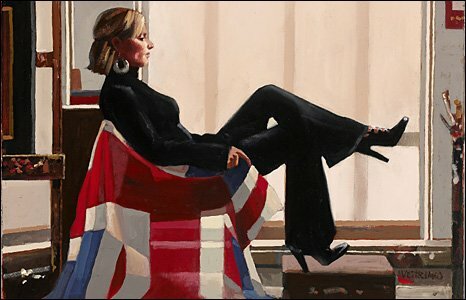 Jack Vettriano's oil painting of Zara Philips fetched the highest sum at the auction of £36,000.